I lived in New York City for a brief period some time ago, and you got a clear sense of history from certain parts of the city. There was grand architecture from the 1920s, and apartments with fixtures from that same time period, steam heat for buildings, etc. Later on, work brought me to Philadelphia where the sense of history was even greater. It was the nation's first capital, it has cobblestone streets, and dwellings dating back to the 18th and 19th centuries. However, such history is rendered modern when you visit a place like the southwestern USA. I have visited several cities in the southwest over time, but have always wanted to ride in the area. Logistics have always prevented this, until I decided to try an option that has been around for some time. Why not rent a motorcycle? Previously, the rental business has been mostly centered around Harley Davidson bikes, and I wanted to ride a BMW. Nowadays, in most big cities, you can rent a variety of brands, and in Vegas, you can rent anything including people ;-) Renting a motorcycle is not cheap. You can rent a car for a third of the price. And the hold they put on your credit card is hefty, so beware. That said, in a crazy town like Vegas, I don't blame anyone for building misbehavior into the price. Armed with a loaded R1200RT, and a some time, I headed out of town before first light. The good thing about Lost Wages, NV, is that it takes all of ten minutes to be in the middle of nowhere. In my case I headed northeast for about 45 minutes and then east to my destination, Valley of Fire state park. The time scale of this region is hard to comprehend given our tiny life spans and frame of references. Millions of years ago, this park was the floor of an ocean. The movement of tectonic plates, and volcanic activity pushed the floor up and caused the ocean to recede, eventually leaving a sandy desert. But what makes this park special, is the particular combination of limestone, sand, iron oxide, manganese, etc that create a palette of colors throughout the rock formations, and give the park it's name. 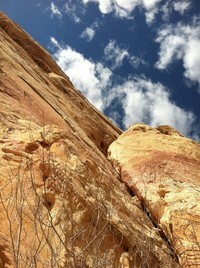 The browns, reds, oranges, and yellows contrast dramatically with the surrounding monotone desert grey. Since the park is a valley, it seems like you round a corner and suddenly descend into a color movie from one which was black and white. Perhaps the most striking aspect is that the colors can change from rock to rock mere yards apart, but they also change within a single rock. The permutations are infinite, and it makes the scenery all the more spectacular. No Hollywood movie theater with all the computer gear in the world could create something this incredible. You can literally witness the evolution of the park in the striations of the rocks long before you get to the visitors center to read about it. I was there early, so the visitors center was uncrowded. If it was not for the spectacular scenery outside, you could spend a good deal of time reading about the parks' flora and fauna, watching short movies, etc. I was anxious to move on. The Mouse's Tank area of the park is a small canyon where you can take a self-guided tour of an area utilized by the Anasazi people from around 300BC to 1150AD. 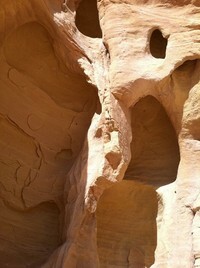 They left stories and artwork in the form of Petroglyphs along the walls of the canyon. I was literally walking along the same path as people 1000 years earlier with an almost identical view. There are not many places in north america where you can do this. It is believed that this site was more of a temple or cathedral than a dwelling site, and I can see why. In the early hours there were very few visitors around, and you could sit in silent reverence among the towering picturesque rock formations with a brilliant blue sky for a canopy. I left when more visitors began to appear and headed up the road to the White Domes area of the park. This area is named for the prevalent sandstone formations, which by this point are quite a contrast to the reds of Mouse's Tank. There is a short 1.3 mile hike down into the white domes area and you can see why it was used for many western movies over the years. There is even the remains of an old movie set. The huge areas of slick rock allow you to chart your own path and include some light rock climbing into the loop. The park continues to deliver vistas as you head toward the eastern exit, and has inviting unpaved roads that made me wish I was aboard my GSA rather than the RT. There are cliff dwellings and juxtapositions of rock formations that will leave your digital camera out of memory if you try to capture them all. Now these are high-rise dwellings that would be worth Manhattan prices. I left the park and headed south running parallel to lake Mead. This road is a beautiful piece of asphalt with sweeping turns for 40 miles. The scenery appears milder in comparison, but it would be superb if you had not already been through the park. You can really open up the throttle and it made me long for an S1000RR rather than the RT. The road ends near the Hoover Dam and I took the short ride over only to crawl through the Dam crowded with visitors. This Dam is an impressive engineering feat, and a great accomplishment. It is a short ride back to Las Vegas, which is a city that is so colorful and modern that it stands out even in a global competition for such attributes. However, my advice is not to visit any man-made attraction, old or new, immediately before or after you visit the Valley of Fire.